I began researching my family tree using Ancestry.com. That site is so easy to use, it was great for getting me started. But I could not find any information about my great grandmother. I knew that she and my great grandfather had owned an Inn in England and I found the Inn. (It's still there!) I also found my great grandfather's lineage going way back. But I could not find anything about her family. I used all the Ancestry.com resources and drew a blank. So I bought the software that Ancestry.com sells and downloaded all my records. Then I began to search the web. Soon I found more helpful websites. But, amazing though it seems, six of these sites had been acquired by Ancestry.com and searching through them took me right back to where I had started. The six are Genealogy.com, Archives.com, FamilySearch, Rootsweb, MyFamily, and Folds.com. I looked harder. I discovered Cyndi's List (cyndislist.com) and that helped a lot. I still go back there often for clues and ideas. I found MyHeritage.com located in Isreal and offering lots of international records. I found Geni.com, a world-wide family tree where everyone participates in linking up families. I found Genealogy Bank, a resource that is harnessing volunteers to photograph gravestones the world over, and I found GenAlone.net where you can build your own genealogy website. I found lots of helpful things. There are places that will do all the research for you. You have to pay them, but they are real genealogists and they often do a great job. I found my own library and super helpful librarians, and I found the Library of Congress. These are all free. Along the way, I found a map of my great grandmother's village. The map was made when she was in her late teens. I could imagine her walking on the cobblestones and worrying about becoming an old maid. I love to look at that map. The most recent discovery has been the scholars. Independent, dedicated, with all kinds of diplomas, these people set the standards for genealogy. Some of them are the American Society of Genealogists, the Association of Professional Genealogists, the Board of Certified Genealogists, and the National Genealogical Society. The Federation of Genealogical Societies is the backbone for Genealogical Societies in just about every city and town. These are people who love this research and want to help. The make interesting friends too. Join the hunt, you won't be at all sorry. Every now and then we discover an outstanding researcher. Kenneth Marks, who has developed The Ancestor Hunt, is just that. He has lists upon lists of places to find information, tutorials, and just plain good advice. A great place to stop and visit during your reseach. All free too. Ken just loves what he does. Tell him we sent you. The Ancestor Hunt. I hope you have noticed that the word "genealogy" contains the letter "a" and, like all words, this one wants to be spelled correctly. There are other big words in the study of geneaogy. Filiopietism has to do with excessive veneration of ancestors. There is also lineage, progeny, and ethnography, to suggest a few. It might be fun to use some of these words at a party, as in, "I became so engaged in my lineage that I began to suffer from filiopietism." Should stop the conversation right then and there. After I found my cousin, we talked on the phone for a couple of hours. She told me a story about our great grandmother and her magical ways. The family had emmigrated from England to Kansas in 1873. They established a farm where they raised cattle and grain. One day, one of the smaller children cut off the end of her finger. My grandmother sent the other children to the barn to gather spider webs and she attached the little finger and wrapped it firmly in the webs. In time, the finger grew back together. My cousin and I are becoming friends. She is quite special and I think she has some of our great grandmother in her. 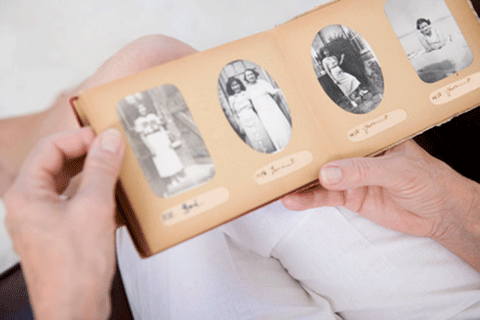 If you want more, Family Tree Magazine lists the Top 40 Best Genealogy Blogs each year. I have a shoebox full of old family photos. I thought I would be able to find out about some of those long gone people. Besides, there was a chance I might find a cousin or two still living. We could get reacquainted and share stories.